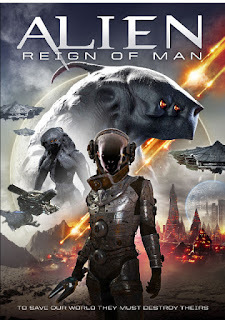 The synopsis of this movie is brief but it would seem this is about a team of trained soldiers immune to a virus that have been left stranded on an alien planet to try and fix a machine that will restore Earth to its former glory in the time before the virus. To do this they must battle with aliens and contend with the planet itself which seems to be terraforming around them. I am grateful for this description as on viewing this myself I did not have a clue what was going on, when and why?!! I eventually realised it was jumping backwards and forwards in time with all manner of flashbacks in between, none of which were obvious or seemed to explain anything at all. I realised I kept zoning out when one character seemed to disappear in an instant without a hint of reason why only to be replaced by another, leaving me to wonder if I had just dreamt up the first character on my own in a desperate attempt to make something interesting happen but I think it actually happened. There appears to only be the one alien hunting them at a time, they are actually quite cute looking but try not to look too hard as the CGI used to create them is absolutely appalling. The characters are all wet blankets with the exception of the heroine Zan, played by Khu (Dark Moon Rising) but I’m not saying she was any good just not quite as wet. She still put in a boring half arsed attempt and I spent half the time wondering if that was all her real hair and the other half drifting off into a coma at her and the rest of the casts’ lack of enthusiasm and dull dialogue. There is very little in the way of real action going on, it just seems to be a lot of aimless wandering around interspersed with brief encounters with the aliens, the ending is a massive let down and the end credits run about as slow as the rest of the movie. The soundtrack does not help it even slightly and I found it rather annoying apart from the music right at the start which was quite promising. I only found a couple of other reviews of this online and I commend the reviewers for their kind and diplomatic responses to this. I found no ounce of art or creativity in this at all; even though it is low budget I have seen way better attempts so they cannot use this as an excuse. Perhaps I am being harsh but I feel that I am owed an hour and a half of my life back. One line mentioned a few times in this just about sums it all up and that is “This doesn’t make any sense”. I agree with this statement….